Friday May 23rd 1902 I made one of my carpets what time I could get from the work. It was hot after the rain. Mollie went down to Otts to stay tonight. Saturday May 24th 1902 Will and I went to town early this morning. I had some work done at the clinics, and took in butter and eggs to Barths. I met Uncle Jim and paid him the $800.00 I owed him. got home in time to get dinner and sewed on my carpet in the afternoon. Will went to town again. The boys fixing fence. Sunday May 25th 1902 I was busy about the house most of the forenoon and Will went to the pasture. We went away in the afternoon. Will stopped at Woolfs and I went on down home. Mollie is there but she did not come back with me. Did chores and went to bed early. 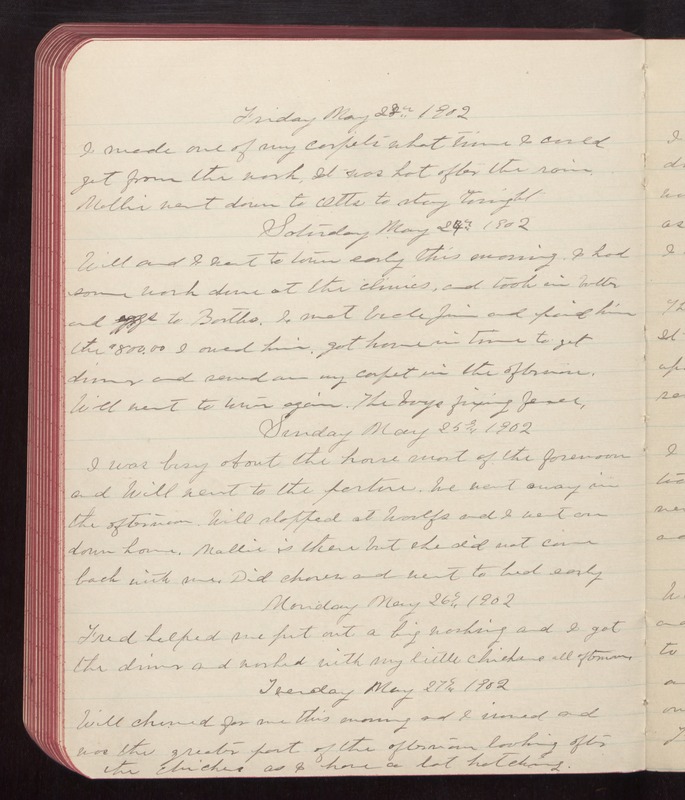 Monday May 26th 1902 Fred helped me put out a big washing and I got the dinner and worked with my little chickens all afternoon. Tuesday May 27th 1902 Will churned for me this morning and I ironed and was the greater part of the afternoon looking after the chickens as I have a lot hatching.